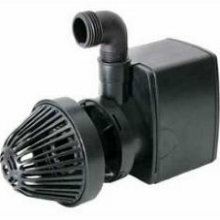 Little Giant Pool Cover Pump - 550GPH This Little Giant pool cover pump will remove standing water up to 550 GPH at 0' lift - 400 GPH at 3' lift from your winter pool cover and is ideal for household water transfer applications. It comes with a removable intake screen for easy cleaning and maintenance and has a 3/4 inch garden hose connection for easy installation. This winter cover pump comes with a 25 foot power cord. LITTLE GIANT COVER PUMP - THE ORIGINAL COVER PUMP ! Famous cover draining pump attaches easily to your garden hose and pumps off even the deepest water on inground or above ground pool covers. Fully submersible. A must for all pool owners ! This pump is a workhorse. Comes with garden hose adapter. 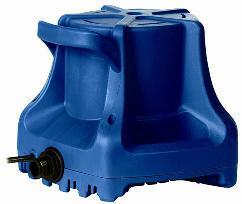 From the largest maker of submersible pumps comes the Little Giant "Water Wizard". 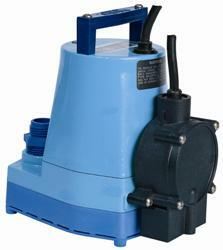 This 1/6 hp fully submersible pump has a 25' power cord and can pump up to 1200 gph. Don't let the size of this little pump fool you...It's a workhorse. It pumps down to 1/8" and is designed for continuous duty. Use it to drain your pool cover, drain your entire pool or drain your spa. There is nothing this little baby can't do. Outside Housing is made from epoxy coated cast aluminum. Connects to a standard garden hose. 110V. 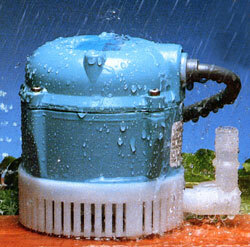 Little Giant Automatic Pool Cover Pump APCP-1700. 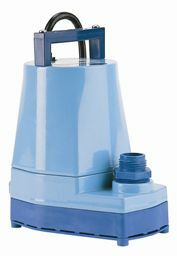 This swimming pool cover pump automatically turns on in approximately 2" of water and deactivates in approximately 1.5" of water. Just drop on your swimming pool cover and let the Little Giant Pool Cover Pump do the work for you. Pumps up to 1700 GPH and has a 25' cord. Exactly as the Water Wizard above except this unit has an automatic shut off mechanism that will turn the pump off when the water gets below 1/4". Automatic/Manual submersible utility pump with oil-filled motor and epoxy coated cast aluminum housing. For commercial, industrial and home applications where liquid must be transferred or recirculated. Pumps down to 1/8". This 1200 GPH pump features a 1" FNPT discharge with garden hose adaptor, 26.3" shut-off head capability, and screened inlet. or winterizing supplies outside of the 48 Contiguous states.